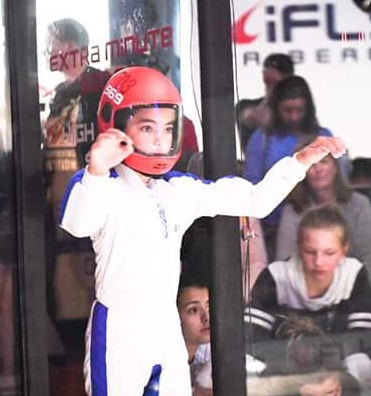 Before finding iFLY and tunnel flying, Ben was suffering from a great deal of frustration, panic, and anger from school. While Ben’s language testing was nearly at a college level, nothing was making sense to him, and he was eventually diagnosed with a learning disability called Auditory Processing Disorder, and was also showing symptoms of Sensory Processing Disorder. The affects carried on each year and because Ben was unable to process information from his teachers and peers, he was bullied by classmates. It grew worse each week, until Ben experienced flight. The flying all started by random chance. The Lammon family was gifted an iFLY experience for Christmas from a friend. They knew nothing about the sport, or even that it existed. On Ben’s first flight at iFLY Tampa, he was so relaxed that he needed very little guidance from the instructor. The Flight Deck was packed, and everyone stared in awe at the young boy who was completely in control on his first flight in the wind. Minutes later during his second rotation, he was learning to go up and down, and did a 360 turn while the crowd and other students cheered him on. The loud clapping and the atmosphere of excitement was an extremely special moment that his family will never forget, and so their flying journey began. Ben was able to find clarity in the wind and shortly after that first flight, Ben’s grandfather arranged for him to start regularly flying in Flight School. The more he flew, the more his mother, Beth Lammon, noticed changes in her son. He had finally got what he was seeking. His sensory needs were met beyond what Beth could ever comprehend. Instead of exciting him, it calmed him down. It made his anxiety melt away. The issues he was facing in school were starting to subside. He previously would shake his hands, twist his hair out and pick at his arms in frustration. Through flying, he was able to overcome these sad coping mechanisms. He also had issues with balance, core strength, and trouble with sports. The tunnel gave him huge leaps in core strength and Ben has been growing to love himself more each week through gaining strength from flight. 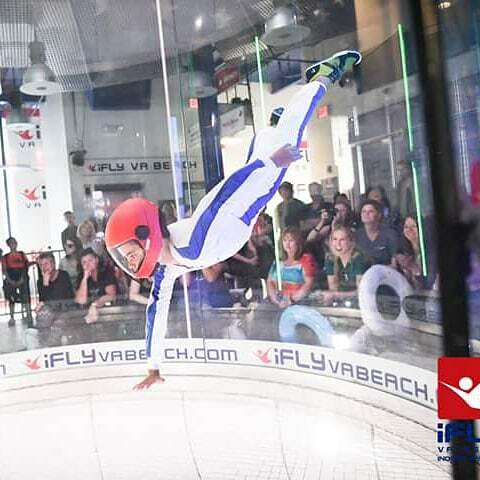 Fast forward a year, while competing in the Sunshine Showdown Tunnel Competition at iFLY Tampa, Ben got to meet and watch some of the best kid flyers in the US. He was inspired and ready to compete at US Nationals, but the family was in no financial position to make it there. Beth decided to raise money with friends and hair clients through a YouCaring fundraiser account.They were able to generate a few thousand dollars to keep flying once a week for Flight School, and to attend Nationals. The excitement built up week over week as he trained his hardest for Junior Freestyle. Finally, the time came and the Lammon family made their way up the coast to Sunny VA Beach. Ben loved every second of the competition. He got 7th place and was awarded one of the Judges Choice awards. It was the highlight of his year! He left with a full heart, new friends, and some big goals in mind. Ben’s goals are to work at iFLY once he is 18, and is confident that it will be his first job. He also wants to teach others to fly, and often brings in kids and other families in, to introduce them to the sport as well as the health benefits for kids with anxiety. Beth and Ben came up with Ben’s Free2Be FLY League, and hope one day to find more funding to make it an affordable program for kids with learning disabilities or who are bullied or have difficulties fitting in at school. They are also working on getting a study underway to document the added health benefits a wind tunnel can offer people. Beth said:“From learning disabilities, to strength and balance rehab, to PTSD, anxiety relief or occupational therapy, the tunnel is an amazing tool that can help so many people as it has and continues to help my Ben. What keeps Ben in the sport is the people he meets, and the feelings he gets when it’s just him and the wind".